Sixth Graders spend the year learning about American Jewish History: Immigration to America, Jewish Genealogy and Personal Jewish History. 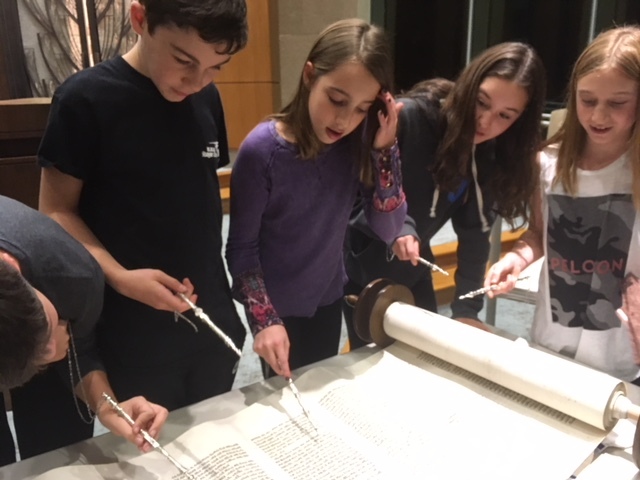 This pre-B’nai Mitzvah year gives our students the opportunity to place themselves within their own family’s stories as they prepare to take their place in the unfolding narrative of the Jewish people. Sixth Grade families participate in creating a phenomenal and personal Sixth Grade Family History Museum. Our Sixth graders also participate in the retreat weekend. In Hebrew, our Sixth graders continue to practice what they’ve been learning and begin to learn parts of the Torah service they will lead when they become Bar/Bat Mitzvah at Kol Ami. This year each family will attend three required B’nai Mitzvah Workshops where you will meet and interact with the other 6th grade B’nai Mitzvah families.